Stunning 1930s bronze and iron andirons, in vintage condition well made and very heavy. In vintage original condition, the bronze have been lightly hand polished. minor wear and patina to the bronze and iron. 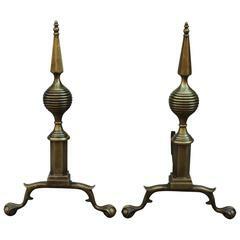 1940s Art Deco claw and ball feet brass andirons. Stunning set of 1960s modern French brass andirons, lightly hand polished. 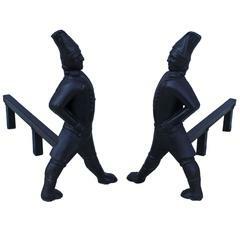 1940s Hessian soldiers cast iron andirons. 1940s English brass medallion andirons. 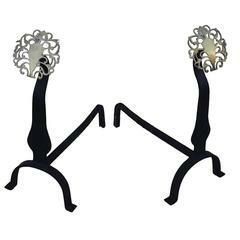 Pair of stylized standing whippet andirons in blackened bronze.